Cycling arm warmers can extend the time of the year when you can wear your favourite jersey, or add extra insulation under a jacket if your arms feel the chill. That’s especially useful on autumn and spring days that start cold – you have them on, and then when it unexpectedly warms up, peel it off and effortlessly stuff them in your bag or pockets and continue on! This versatility to your cycling wardrobe is of course priceless. You definitely should make this product a staple among your other gears. As with other Izumi products, these have had a lot of research and technology gone into its design and construction. Ticking the right boxes, your only difficulty with these is choosing between the two colours – black for easy matching with your other cycling get-up, or the aptly named screaming yellow for high visibility and attention-seeking qualities. Sizing has been hit and misses for some. The silicone holders especially, tend to hurt and even lead to numbness. This is if you get too small a size for your arms. The holders can also loosen, slide and sag if not sized right. The fabric that is used for Pearl Izumi Elite is fleece, which has been enhanced with a lifetime lasting water-repelling layer, aimed to keep you dry. You can imagine that these will keep you reasonably warm, and protect you against the wind. The feel of these has been described as a cross between Lycra and neoprene, stretchy in the right places. More so as it incorporates the anatomy of each hand for a good fit. The top of it has a wide band of silicone to latch onto your skin/jersey and hold it up. With the addition of fleece and water-repellent coating, this is a premium quality product that will boost your enjoyment during rides, as it keeps your hand warm and free from wind-chill. Its lightweight factor is alluringly useful – it deserves a permanent place among your gear, as preparation to face any type of weather. As apparent in its name, the main appeal of this Gore Bike product is its claim to shield your arms from wind and wetness. Made of soft-shell, elastic material, it comes in black on black or white on black for easy coordination with the rest of your outfit. Due its wind-proofing quality, these are somewhat stretchy and are inflexible. You may experience this if you try to move or bend from the usual cycling arm positions. Care should be taken in getting them on or off, as too strong a pull on these may result in its seams unravelling. With long rides, comfort is optimised with the Gore Bike warmers, as it is designed with abrasion-proof seams. The elbow area has been pre-shaped, and to maximise the material’s hold and prevent it from sliding down, there are silicone grips placed on the top rim of the arms, as well as cuffs that hugs your wrists snugly. It is possible for you also peel them down from the top should the weather suddenly warms up. Feedback on breathability has been widely positive, with pores to ensure that moisture passes through. Its fabric make-up provides excellent insulation, without the heft. This makes it great should you want to layer up when its get colder. These are also easy to clean – just pop them into the washing machine. For those in-between weather conditions – not too cold, but not warm enough, these are perfect! 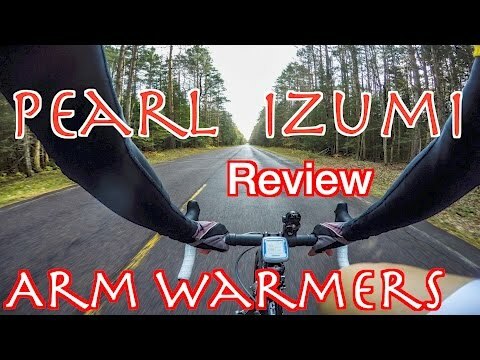 It functions as promised and satisfaction is guaranteed in terms of providing warmth and blocking wind, while at the same time porous enough to allow just the right amount of air to pass through.If you are seeking warmth more than compression we suggest to read our guide about the best arm warmers . Standing at just 69 grams weight for a pair(! ), these roll small enough to fit your pocket and you probably will forget that it is even there! It is made from Castelli’s own special fabric – the Nanoflex, on which light rain and moisture slides off while maintaining warmth. 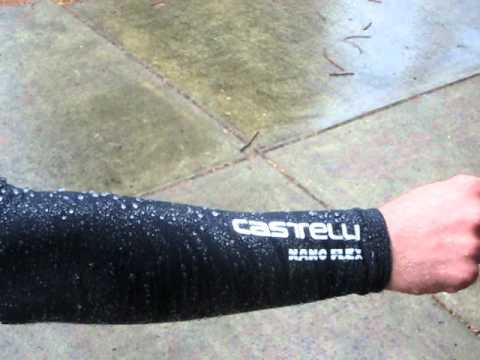 Bear in mind that Castelli Nonoflex \ is not entirely waterproof, it will still be soaked through in heavy rain. Be prepared for it to feel quite tight the first few times you have it on. This generally eases with time. Durability is an issue, as you can expect its seams to unravel at certain weak points with vigorous tugs and pulls. This also only comes in black. The highlight of this cycling arm warmer is its breathable but water repellent fabric it is constructed from. It is however also noteworthy to mention that its most loved feature it the great fit, spot-on sizing and elasticity which allows your arm the freedom of movement and dexterity for hours on end. This flexibility of the Nanoflex reduces the hassle in taking it off and having it on. It also stays in place, is not prone to slipping due to the double sided silicon bits on the upper areas. Your ride will be trouble free and more enjoyable. Its quality is further ensured with a manufacturer’s warranty of one year from the date of purchase. Spot on sizing, with extra attention paid to ensure good and enhanced rider satisfaction makes the Castellli Nanoflex a worthy buy. It is easy to take with you at all times due its lightness, plus you will be well-prepared for any eventual inclement weather – drizzles as well as wind chills will not deter you from potentially the best ride of your life. Ginger, white or black, pair these up with your jersey and you will not only be stylish, but also remain snug and cosy. Take note if you have longer than normal arms as these may come up too short for you, as attested by some. Annoyingly, these do tend to slip, exposing a band of uncovered flesh on your biceps. One way to overcome this would be to check the sizing chart carefully, as it might be caused by incorrect measurements. It does let in wind through, and due to this you may want to consider added layers on standby for really cold temperatures. These are made with the manufacturers own HeatMaxx fabric, which consists of a smooth fleece-brushed internal layer meant to flick off water and contain heat internally at the same time. Equipped with silicone material on the bicep area – these stay on until you take them off. Adding to the rider’s content is its flat lock seam, as this feature aims to prevent friction between your skin and the fabric, thus allowing you to stay on your bike much longer. Safety is enhanced not only when you select among its highly visible colours, but also through reflective elements strategically placed to catch light especially for road-riders. Its lightweight and soft fabric allows air to flow, and just fold these into your bag or pocket when it is no longer needed. These are the product for you, if you do not want to wear a vest but need a boost in warmth. It delivers both, while drawing the much needed attention with the bright colours while you are on your bike for added safety, while also being small enough to carry around in your back pocket for when it is needed. Made of soft, good quality Merino, if comfort is what you look for, then this is the right product for you. While the words toasty and winter rides may not be uttered often in a sentence, this is exactly what you will get in the case of the DeFeet cycling arm warmers! The slightly narrow tubular design of these makes it cumbersome to pull up all the way up the biceps, especially if you are of athletic built. Once it is up though, it does not stay put, with a tendency to roll down. Further feedback on it is that it is also rather scratchy – so beware for those who cannot stand this material. Compared to similar products, it is unsurprisingly bulky and it is rather low on visibility as it only comes in a dark colour. Proudly made in the United States, DeFeet cycling arm warmers offers a straightforward product, sold sans the jumble of jargons of others on the market and hits the mark for being spot on. Winter wear has always incorporated wool, and for good reason. These gets plus points for the soft, fuzzy feel it offers on a cold day or night, beating more modern cycling arm warmers in this department. Wool is also breathable and offers incomparable durability. Rest assured that your pair would withstand a ride in the washing machine, coming out of it retaining its original shape, with hardly any shrinkage. If basic warmth is what you need, the DeFeet delivers. Made in the United States from good quality Merino wool, this will hug your arms and keep them snug throughout, while allowing them to breathe at the same time. Sleek and light as it is aptly named, this Endura product aims to satisfy hard-core cyclists who seek to ride in rain or shine, cold or humid. Comes in black with increased visibility through reflective strips, this will go very well with any coloured jersey. These run rather small – if you workout and have considerably beefed up biceps, do opt for a bigger size or risk being uncomfortable. It may still feel tight during the first few uses, so you need to persevere and it does eventually stretch out. These comes only in black, therefore you will have to look elsewhere if you so wish for more aesthetic variety. Made with fabric technologically enhanced with Teflon to wick off beads of rain as well as designed with insulating properties, the Endura makes for an enjoyable ride, protecting the wearer from the worst of the elements. It stays up your arms due to the silicon grip, so rest assured that these does not slide down easily. The fit of these are remarkable, it gives the wearer a good balance between not cutting your blood circulation off though designed to be form fitting. The dexterity of your limbs is still maintained, without the feeling of being restricted in any sort of movement. These are meant to be easy take on/take off products and it works well in this regard. Squeeze them inside your jersey or tights pocket when the weather heats up, as it is not hefty at all. For the ever-ready cyclist, these should have a permanent spot in your bag or pockets. It weighs close to nothing – good enough to carry around, small enough to fit anywhere, and provides protection against moisture, light drizzles and also chilly winds. The Giordana has made use of the Super Roubaix material in its construction and for good reason. For those unfamiliar with this fabric – it is fleece-backed Lycra, aimed to add and retain body heat while preventing the cold from getting in. This will no doubt enhance the Giordana’s appeal to those looking to stay heated up outdoors when the mercury drops. The seams are clumsily sewn, and when the cycling arm warmers are worn for an extended period of time, certain sections feel bumpy and uncomfortable. The upper bicep section of these are secured with elastic grippers, but without any silicone added. It therefore tends to slide down rather easily. With two colours to choose from – basic black or bright white, these make a good addition to your cycling apparel. The best feature is of course the cosiness it offers, having been made with Super Roubaix, but not to forget that Lycra also adds to this product in terms of ensuring perfect, form-fitting comfort. The elasticity means that you can move your hands and elbows without restrain and therefore will be able to enjoy your ride much more. There are reflective elements in the form of the Giordana logo added on these, thus making sure that you are highly visible to others. These are minute when folded up, and this increase its allure to the light packer. No frills in this cycling arm warmers – it promises warmth and it delivers warmth. Other added bonuses of course include its slim-fit and almost featherweight quality, making it an essential part to every ride. These individually sold arm sleeves are intended to improve your blood circulation and support your limbs from early onset of fatigue while you are engaged in activity. Its attractive and bold pattern and striking colours sets you apart from others and increases your visibility even from afar. Do note that these are not sold in pairs, but individually. It does not stay put and needs constant adjustment during activities, which can be distracting and cumbersome. It is also thin – may rip easily therefore be selective of what you wear them for. It only keeps you minimally warm due to its thinness. With its tight-fitting design, the compression it provides is noteworthy. It is also elastic enough to ease in wearing and taking them off – a plus point for when you are in a hurry to get going. It is also durable, sewn together with flat lock stitches, which has been known to hold fabric together extremely well. The brightness of the colour and design remains vibrant even after more than a few washes. Being ultra-thin, its breathability is incomparable, while at the same time preventing droplets of sweat or water to settle in and soak through. You will no doubt be comfortable in these. It is ambidextrous in design – it can easily fit on either arm. For those needing extra boost in terms of blood-circulation and fatigue-reduction, these must be among the products to be considered. Coupled with its unmistakably alluring print you can go about with the confidence that you are highly visible and probably be the centre of attention! With current concerns on cancer risks from sun exposure – these come with added UPF50 sun protection and are attractively designed to boot. If you love being in the sun, you can be confident being outdoors in these, knowing that you have additional safeguards against ultraviolet rays – still, do not forget your sunblock! As you put them on the first time, expect a less than perfect fit, you do need to wait a while for the material to encase your arms and fit properly and you will feel better about it. Do note that over time, it gets a little loose and will slide down the length of your arms. Columbia has done well in making sure that these state of the art sleeves function as intended. It comes with the patented “Omni-Freeze Zero” feature, where as you sweat and a light breeze hits, you will be enveloped with a pleasant cool sensation. This feature adds to making sure you are comfortable yet your limbs are protected. No longer will you feel the baking sensation when you have these on. The special fabric also shifts sweat away from your arms, and due to its super thin and light texture, you will often forget you have anything on at all. It is elastic, and therefore easy to put on. You will not have trouble taking these off even if you are still sweaty. Take advantage of the technology offered by Columbia and get these if you are constantly outdoors or are just someone who enjoys being cool when the temperature is high up. The UPF 50 deserves a second mention as this means that you are getting more than just barrier protection from the material but reflecting away harmful rays from touching your skin. Classy in outlook, with two colours – heather black and heather grey to choose from, these are easily matched with any sort of gear. The singularly sold Phiten sleeves are made for those looking to protect against harmful ultraviolet rays while being outdoors, and is the choice of anyone with concern over premature muscle tiredness or aiming for enhanced sports performance. Unfortunately, you will have to be prepared to continuously pull these up, as they do not stay put on your arms. It is also rather thick – if you are looking to wear these in warm weather, be prepared to sweat! If you have scoured high and low for sleeves that are long enough to cover the length of your limbs up to almost the armpit area – look no further. These have been made extra long and fits better than most products in the same category. It has been given great feedback when it is worn for the purpose of reducing tiredness in the arm area as well as when recovering from certain muscle injuries. The thickness of the material provides support to the elbows and special fabric, namely nylon/polyurethane makes this soft on the inside. It is sewn and put together to endure a lot of use and its manufacturer is proud with its “Aqua-Titanium” feature. It keeps sweat away from your skin, which also makes it more pleasant when in high temperatures. Rather versatile for use – be it for sports, for injury protection and recovery or simply for walking about in the sun – this fits the bill. Definitely worth the money, you can just pack these with you and you have all you need! For your love of cycling, you probably often wonder how you could possibly extend your season outdoors. Or you have been caught starting out on a bright sunny day which turned chilly and wintry within hours, and thought of wanting to be prepared these conditions. Consider arm warmers as part of the answer – it can revamp your summer garb to brisk-ready ensemble in no time, without having to bulk up. With the various lingoes surrounding this specific product – from specialised fabrics, protective UV ray features, it can nevertheless be confusing. As selecting the right accompaniment during rides makes or breaks your enjoyment, stay with us as we take a closer look at the attributes of this product and guide you to a getting it right. Terms you need to understand includes – Lycra and jersey material, which you may be familiar of, and Roubaix, which you may not. Roubaix is Lycra that has fleece sewn onto the back of it. This construction bags air up against your skin, effecting in warmth for you. There is also Super Roubaix – with added extra thickness for the same purpose. There is also knitted fabric, which can be made from plush wool, sometimes of luxurious Merino or the basic polyester. With knitted fabric, the advantage would be the lack of seams (if it is knitted as whole piece) in the arm warmer design. Seamless designs reduce the chance of material rubbing against your skin, a small but pertinent detail to enhance your ride. With recent technological developments, fabrics have also been enhanced with special features. These include water-repellent qualities. Bear in mind that eventually it seeps through, just that it’ll take longer to do so. With the recent sunny temperatures witnessed this last summer (and also predicted for upcoming years) you could also consider UV protective arm covers. The second thing to consider when shopping cycling arm warmers should be how it will grip and stay in place on your arms. If you buy a pair, you surely do not want something that will ruch up or down and distract you while cycling. In this instance, consider the use of silicone on the edges of the arm warmers, either on the inside to latch onto your skin or on the outside to grab hold of your jersey or clothing. As for length, it is supposed to start from the wrist and touch your biceps. Pay attention to measurements of the manufacturer for accuracy. With the array of products out there – this guide has covered the basic features to look for. These are the fabric, design, grip and additional features that may be important to you such as UV protection, water repellent qualities. With your limbs protected and comfortable, we hope that your rides are more enjoyable, that you and your bike ride further and that you stay out longer, be it in the rain or shine, in chilly or sunny temperatures.